I was always fascinated with the sea, but I always ended up on the shore because of the fear of drowning. Swimming, I thought, was only for fishes and mermaids. Only realized recently that swimming is a necessary life skill. Actually, missing a number of cliff jumping moments during travels has triggered me to enroll in a swimming school…finally. Among the swimming schools I’ve looked into, I prefered Swim Central. Students can choose their preferred time and venue. Basic lessons cost only Php3,920 (US$75), but it took me two years to overcome my stingy ego. The best thing about this package is that it includes survival lessons, which I badly, badly need. T’was a cheery, sunny day to swim at Ultra in Pasig. Just get ready to have a perfect tan. The coaches are always on time. They help improve every student’s skill level even though everyone in the class have different skill levels from one another. You might think they are leaving you alone after teaching the skills for the day, but they’re actually watching over you. I get a lot of corrections after finishing a few laps, to which have become very helpful. Every class was an agitating moment for me. I actually felt like a newborn thrown into the water at first (actually, newborns might be more fearless than me). The coaches would always assure us we would not sink, especially during the survival phase. Deep inside, I was freaking silently, especially when the coach told me to let myself go into the 14-feet pool. I had to jump into the water over and over again until I felt comfortable in the deep. The downside was that I kept of dreaming I was swimming upwards. I guess I wanted to dive into the water more. The 14-feet pool at Mares in Makati. For now I find this comfortable because the deep is placed in a controlled setting. I have this sense of fulfilment after learning a new skill. After a few weeks, I have learned to befriend the water. I have to let go of every anxiety because I was determined to become an improved human being. As one coach said, people don’t die because of the water, but because of the fear. We only drown in the water when we’re heavy with panic. I don’t have to envy my friends who know how to paddle like a dog (because I can now do that, too :D) nor do I have to worry that my head will bump on the side of a cliff if I try to do some tombstoning. Angeles City in Pampanga is just one of the Philippines’ sought after tourist spots. From restaurants to amusement centers, most of these were made to cater tourists, especially the foreign ones, who arrive in the country from Clark Airport. But local tourism also abound in this area. As Valentine’s Day arrived two weeks ago, it was also celebrated with the yearly Hot Air Balloon Fiesta at Clark Freeport Zone. But before we went balloon watching, we first tried another, action-packed amusement park in the area. The air was cool but the sun was beginning to scorch when we arrived at the Deca Wake Park. We came an hour earlier from its opening time which was at 9:30am. While munching on some chips left over from our two-hour travel from Manila, we chatted excitedly on how we would glide over the pool now glimmering beneath the cloudless sky a few hours later. Now should have been the perfect time to go wakeboarding. But half of me was musing to back out of it while still early. Deca Wake Park is one of the exciting places to visit when dropping by Angeles City, Pampanga. Water sport enthusiasts and adventurers alike plunk their boards and surf through the waters while being towed by an electronically-maneuvered cable. Looks easy for the sun-tanned surfers here. For beginners like us, it’s a dread. company outing. But I never succeeded anyway. Besides, I’ve witnessed how one of my friends had an injury when a loose cable pulled her arm after she fell into the water. That same friend was with us at our second attempt to go into this sport. Lans did not have a bit of that injury or even that dread as she lined up at the beginner’s pool. That’s where every beginner should be practicing before flawlessly surfing over the main wakeboarding pool. We need to succeed…well, at least make a perfect round. 1000, but we got to pay only half of it provided that we stay here for four hours or so. Back at the beginner’s pool, I was ready to quit at the back of my mind. I thought of just keep on falling into the water until we go to our next itinerary for the day. But I kept on coming back. I appreciate the instructor for specifically pointing my mistakes before I begin again. Then, ride the waves again. Then, fall. Over. And over. Of course, I did not. The pool was too shallow for that to happen. And we were wearing life vests and helmets. But I had to get out of the pool fast or I might get injured by the then loose cable. To keep yourself safe from loose cables, you can duck your head into the water or just keep it low as you get to the shore as fast as you could. Having legs good for swimming could help, too. Soon, I felt pain on my arm after countless rounds and endless failures. That’s why stretching or a daily workout is important before getting into any sport. But I was not keen at that for the past few days. So, I had to stop. I forgot how I gained balance over the water when I stopped for a moment. Oh well, I have to go back to zero. But in the end I did not make a turn. None of us made a good turn. Some of our friends, who did not try wakeboarding, wanted to leave. We had to run for the Hot Air Balloon Fiesta. Besides, we haven’t had a good lunch in the afternoon. We promised ourselves that we’ll save up for our return at Deca Wake Park. And we’ll make sure that we’ll come on a Thursday. By that time, we’ll make sure to surf a 360-degree turn at the main wakeboarding pool. Trying wakeboarding has been a reawakening of confidence for me, since I realized I could try something impossible at the beginning. 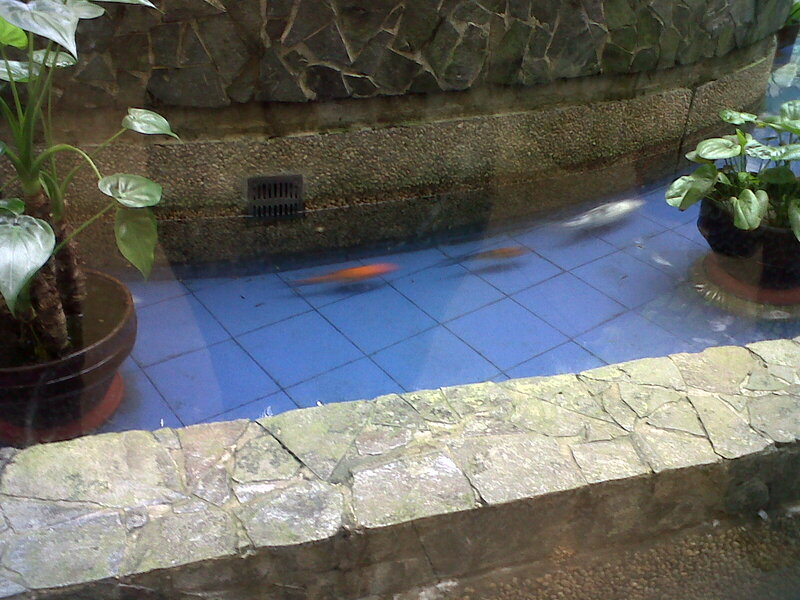 “Do fishes have emotion?” I asked my mom while looking at the pool filled with variously colored koi. I asked the question because I was wondering how they would feel when they’re removed from the comforts of their calm, cultured world. Put them in a running river or the open sea, these fishes might feel extreme stress. The outside world is too hostile compared to the serenity offered by their artificial pond. I wouldn’t wonder if they don’t survive at all in the open sea or the dangerously gushing river. It’s the same with us human beings. We love to stay in our comfort zones. When we are placed in an environment or situation outside these comfort zones, we become stressed. What if like a fish, we have no chance of going back to that artificial pond? We have two choices: give up and destroy ourselves or overcome and emerge stronger. It’s good to be in the comfort zone, but there is also great danger in it. There’s a false sense of peace going on around it, causing us to be unaware how our senses, thinking, discernment and ability are destroyed by a bacteria called complacency. We’re trading all talents and ability for sleep. Thus, when the shell of comfort are destroyed around us, we are caught unaware, too late to realize that all our capacity to survive is lost. But when we are put into dangerous waters, this is the time we use every given ability, talent, and thinking into survival mode. Through this, we learn how to stand up and strengthen ourselves and forge ourselves to persevere until we develop the ability to survive. I’ve been put into such moments many, many times. But at such instances, I wanted to give up and destroy myself, believing its the only way to get out of the problem. But, of course, we are not meant to stand in the flames alone. Do you know how God wanted to partner with us? In Him, we can have all the survival mode that we can need: the abilities, talents, thinking, and wisdom can only come from the Creator of time and space. By the moment I thought I got nothing, I just ask the Father the grace and wisdom to overcome. In Him, I got everything, and in Him I can persevere and survive. When we are put into dangerous waters, don’t curse the moment. Instead, it’s an opportunity and privilege to become stronger and better people yet.